Is ½ a cigar still a cigar? Well this certainly is the case if we are talking about a Half Corona – the classic 30 minute smoke. So one must assume that the classification arises from other aspects of the two cigars. How about assuming that it must relate to the smoking time – more-or-less 60 minutes to more-or-less 30 minutes. Agreed? I would also venture to say that there must be a difference in the blending as the full flavour of the cigar has to develop sooner in the shorter cigar – otherwise it would be a non-smoke, which it isn’t. Technicalities aside, when I am asked across the counter to recommend cigars, my first question in reply is “what time do you normally have to enjoy a cigar?” Often the time is relatively brief, certainly under an hour – and my suggestion equally often is a classic half corona. The perfect proportions of this size (ringsize to length) offer a satisfying smoke in a suitably short time. It is the most versatile of sizes and can be smoked any time of day, in any situation. Whether or not you are familiar with this size cigar, we have put together 3 little beauties for you to enjoy from 25 May 2006 at the inviting price of R135.00. Read about these cigars (from May 25). This makes a perfect gift for Father’s day – 18 June. You don’t need a major celebration or unlimited time to enjoy a good cigar. In this case find just 30 minutes out of your ordinary routine. Who knows - it might become a regular event. (about 1cm, for cleanliness) and store in a glass tube until you are ready for it. Blow through before re-lighting to expel stale smoke. Bear in mind – the second half of a cigar is usually stronger than the first half. but how the company has changed. In the same few years as John Tennison Burrows opened his tobacconist in Durban, South Africa (1905) and Alfred Dunhill founded his empire with his retail shop in Duke Street, London, England (1907), Leonard Dingler arrived in South Africa from Holland (1904). He brought with him a small hand-cutting machine, a little knowledge of the tobacco business and the dream of producing tobacco products that would be sold throughout South Africa. 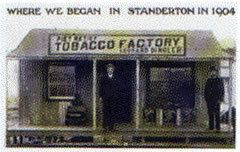 The first factory and shop were located in Standerton – in the heart of the Piet Retief tobacco district. Piet Retief is a plain medium-strong “Transvaal” tobacco – typically South African, and favoured by the “Boers”. It was here that the first Dingler’s No.9 (Full) and No.6 (Medium) were developed. The success of these led to more brands, and in 1908, when Leonard Dingler saw the potential of tobacco sales to the mines, he re-located the factory to Railway Ave. in Benoni. In the 1920’s (when the first Wesley joined the tobacconist shop of J.Tennison Burrows) Leonard Dingler’s two sons brought new energy to his business – and “Boxer” made its mark as their brand leader. I can remember two ladies in my father’s shop spending all day weighing up loose tobacco – most of which was Boxer. Boxer (for strength) mixed with Rum & Maple (for aroma) was a “national” blend (now we have Wesley’s Houseblend No.24 Black Cavendish) – and Boxer rolled in brown paper was the staple “cigarette” for the railway workers near the Tennison Burrows shop. Dingler’s factory also branched out into Shag (Roll-Your-Own), Snuff (Magnet; Gwayi, later called Taxi; and others). In my Dad’s shop amongst the Zulu customers, Gwayi was the generic word for all tobaccos. In 1999, taking advantage of a unique and rewarding business opportunity, Dingler’s was sold to Swedish Match – a global company manufacturing in 15 countries, and sales for its leading brands and niche products in more than 140 countries. They brought their marketing expertise and experience in the field of tobaccos to Leonard Dingler’s established brands – upgrading and streamlining the factory, and fine-tuning the products. In 2004 to celebrate the centenary of the business Dingler’s introduced “Nineteen 0’Four” tobacco – later called Nineteen 0’Four Original when it was joined by Nineteen 0’Four Cherry and Nineteen 0’Four Vanilla. Good quality tobaccos and good value. and the new additions: Coffee, Peach, Rum & Raisin, Whisky. Try one when you have the opportunity. From June 8 to June 21, 2006, while stocks last. No we haven’t just been to see the current production of My Fair Lady at the State Theatre. To start with. .– it’s such a hassle. To arrive in time for a light meal before the show, one needs to leave Johannesburg not later than 4.00pm (to negotiate the traffic) and one arrives home after midnight. Do you think that the Gautrain will help? In the mean time we settled for Audrey Hepburn and Rex Harrison on video. In addition, we’ve been busy organising last week’s cigar dinner – sold out again. Everybody went home happy – especially those who won prizes! The top with 94 points was Sancho Panza “Sancho” – a magnificent “Long Churchill”, individually boxed. It is the same size as the Montecristo A (235mm x Ring47) and should take close to 2 hours to smoke. This size is particularly difficult to produce because it requires exceptionally long and perfect leaves. There are just a few in South Africa – a snip at R200.00 per cigar or R877.50 per pack of 5 boxed cigars. Honestly - if you consider the length of time you will be able to enjoy the cigar (this is paramount) – the price is really good, less than an Esplendido or a Montecristo A. We rarely smoke the very large cigars, but thoroughly enjoyed our “Long Churchill” on a cigar weekend some time ago – a whole rugby match worth. And then just look at some of the other top ratings – Bolivar Royal Corona 93 points, Juan Lopez Petit Corona 91 points. Wouldn’t you just love to try them? The Hoyo I can vouch for as it comes from the same shipment as those used at our dinner. The other two may not be from the same batches tasted by the Cigar Insider panel – you smoke them and tell us how you would rate them. I’m sure you’ll enjoy them, but whether or not - I’d value your opinion. Pipes with real character. .. .. .
To-day the name conjures up images of pipe shapes that are both classic and just off-classic – in fact Danish. But the name was first chosen because it sounded English, and English made pipes were in great demand in Europe in 1942.
optional 9mm filters – charcoal from Stanwell. Today Stanwell is the major pipe manufacturer in Denmark, producing over 100,000 pipes per year, exported to all the corners of the earth. The company still enjoys relationships with the most talented craftsmen in Denmark to produce new shapes. This year we introduce a new pipe range and a new shape. – a classic bent (Stanwell fashion). Stanwell has also introduced a new “Designer Line”. Many pipe smokers have asked Stanwell to take up production of some of the old shapes – and Stanwell have decided that from time to time they will market some of the most popular models. Behind the name S.Bang hides two of the best, very experienced Danish pipemakers: Per Hansen and Ulf Noltensmeier. Per and Ulf have made the S.Bang pipe for more than 30 years. Each of them normally creates their own, individual shapes, but they have for many years worked together to design shapes which could be made in series for the different Stanwell line of pipes. With the help from Per and Ulf we have selected three shapes which are typical for their style. at 25% off the normal retail price. This offer is includes all Stanwell pipes, including the Designer Line. Mind you, if you miss the opportunity now you can still buy them at full price later. At our last cigar dinner, I was asked “How do I start making up a selection of cigars?”... .. .
Gill and I immediately answered: “Buy some Wesley’s Selections”. After the dinner I had time to work out why we unanimously gave this answer. One of the most important criteria for a personal collection is to have a range that will give you a cigar for all occasions. If the usual time you smoke a cigar is during the World Cup or a rugby match, then you will want a pre-dominance of larger cigars. A normal after-dinner cigar would approach 45 to 60 minutes. In either case you will probably find that one or two sizes from each end of the time scale will balance your selection. I personally can’t envisage a selection without a half corona and a Churchill. Let’s first look at a collection of Cuban cigars. Experiment with cigars of the same size in different brands, or cigars of the same brands in different sizes. Each Wesley’s offers an assortment of single cigars for you to try, and there is a wide range of “Handy Packs” – three’s and five’s. An excellent alternative is the variety of “Wesley’s Selections”. The prices are always good, and they include a leaflet describing the cigars with a personal comment on why we put together this selection – for example, comparing flavours or brands or sizes, tasting a pack of diverse highly rated cigars. Plus the stunning Robusto selection from Cuba (which includes the unique Montecristo Robusto). And next week we showcase the “Corona Extra” size – a size we haven’t featured recently, almost a short Churchill and very versatile. The choices are not limitless, but they are extensive, and over the next few months we will give you the opportunity to experience a wide variety of cigars. And let’s not restrict the experiment to Cuban cigars alone. You may enjoy a different flavour cigar on some occasions: Dominican (usually lighter), Honduran or Nicaraguan (similar strength, different flavour), Mature Brazil (naturally slightly sweeter) or European (the short filler is easy burning, and can offer interesting combinations of flavours). Try them out in the same way. - but don’t mix flavours. And keep looking at the website or shop – more selections on the way. You can read more about selecting and storing your cigars in the Library – maybe start with “Cigars – Smoking for Pleasure” and a “Checklist for 2006”. Rafael Gonzales Corona Extra R93.00 - excellent cigars, really well matured now. Hoyo Epicure No.1 R108.50 - lighter to the taste but with great elegance & complexity. Cool smoking pipes – but still within your acceptable price range... .. .
We’re always looking for “value for money”– and especially for pipes that are priced below their competitive market value in smoking quality. Really, though, the only way to achieve this aim is to find a range of pipes from a good brand name where the manufacturer has managed to reduce his labour costs and/or create an unbranded range from the lower gradings of the rough bowls. Savinelli has created the “Capitol” and “Duca di Milano” ranges – not perfect enough for the Savinelli label but, thanks to the basic curing process, very good smoking quality. They are finished by way of cottage industry which also reduces the labour costs. There is one more way – pipes that have been rejected in the final quality checks, just before being released to the market. This is possibly where you find the best value since the pipes have been finished to a much higher standard, but an unacceptable surface flaw (for example) has appeared which would ruin the brand name. These are true “rejects” often stamped “second”. I can’t tell you how many times I have been told by my customers that “the best pipe I have ever bought was a reject “this” or reject “that”. (Dunhill uses such rejected pipes to sell to staff or to give to important visitors. We were considered important enough on one occasion. We watched in amazement as the lady doing the final inspection under a very bright light found a miniscule spot and put the pipe to one side. Now what if we can put together lower labour costs and “reject” status!! When we were offered a small crate of “rejects” from the Albanian factory of Lorenzo, we didn’t hesitate – scruffy as they looked, we just said “Thank you” and negotiated a price. The spit and polish has been completed, and the pipes are ready for the market. Sorting them out was “fun”, but I didn’t waste time trying to justify the “reject” grading. Grouping the pipes into shapes and finishes was enough of a job. Where there were sufficient of the same shape and finish we have included them in the selection of Value pipes on the website. There are more in the shops – come in and have a look (before they are finished). It was only in May this year that I commented that over the last few years Lorenzo prices have remained unchanged, and the Savinelli Capitols (and some other Savinelli ranges) have actually reduced in price. The unfortunate decrease in the value of the Rand has put paid to that. Savinelli prices had to increase with our last shipment and so will future shipments from Lorenzo and Stanwell. But, the double benefit of the low manufacturing cost and the “reject” grading has resulted in a retail price for the Lorenzo Rejects of only R150.00. That’s affordable quality for you. from August 3 to 16, 2006 we’ll offer 25% off. A quality smoking pipe for only 112.50! How wrong can you go? PS “Affordable” is subjective – what about the pipe you want to take into the bush, onto the golf course, or on a fishing trip?